Schlosspark Bad Saarow in Bad Saarow - the best offers! Schlosspark Bad Saarow offers holiday cottages in a fantastic location directly on Lake Scharmützel and surrounded by pristine nature. Enjoy the fantastic views of the lake and visit Berlin! Shopping and sightseeing in Berlin! This price applies to Baby Special, with the arrival as 2 May 2019, 3 Nights. This price applies to Pet Special, with the arrival as 2 May 2019, 3 Nights. This price applies to 6-person holiday house 4+2 (bis 12 J.) 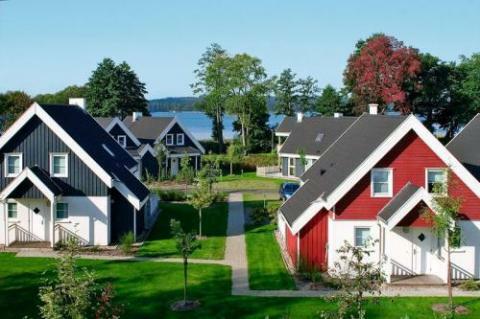 Falster, with the arrival as 2 May 2019, 3 Nights. This price applies to 8-person holiday house 6+2 (bis 12 J.) Fünen, with the arrival as 2 May 2019, 3 Nights. This price applies to 4-person apartment Mön, with the arrival as 2 May 2019, 3 Nights. This price applies to 6-person apartment 4+2 (bis 12.J) Alsen, with the arrival as 2 May 2019, 3 Nights. In case of cancellation to 15:00 hour 30 days before arrival 10% of the booking will be charged. In case of cancellation to 15:00 hour 14 days before arrival 25% of the booking will be charged. In case of cancellation to 15:00 hour 7 days before arrival 50% of the booking will be charged. In case of cancellation to 15:00 hour 4 days before arrival 75% of the booking will be charged. Schlosspark Bad Saarow is characterised by wellness, relaxation and the great outdoors. The holiday cottages are in fantastic locations directly on Lake Scharmützel, surrounded by virtually untouched nature. 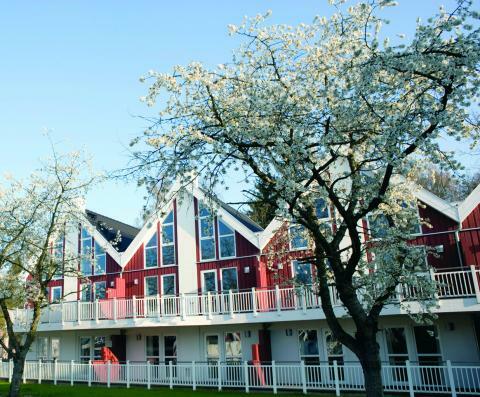 The holiday park is terraced, so almost all of the cottages offer fantastic views of the lake. Enjoy the breathtaking sunsets and visit the dynamic city of Berlin. Schlosspark Bad Saarow opened its doors in the autumn of 2008. The accommodations and park facilities are modern and you have access to your own private hot tub. Most of the cottages also have their own sauna. At the nearby wellness centre Saarow Spa, you can unwind during a beauty treatment or under the solarium. Keep your condition up during your stay with laps in the indoor pool or a workout in the modern gym. The park has no restaurants, but there are several dining options in the area, including restaurants, a pizzeria, a snack bar and supermarkets. Schlosspark Bad Saarow is focused on relaxation, nature and space. Children and adults will not believe their eyes when they visit the giant nearby water park, Tropical Islands, comprising 66,000 square meters. The complex was built as an indoor rainforest and has numerous attractions, shops, bars, a beach and a kids club. The complex is open 24 hours a day, 365 days a year, and always has a blissful temperature of 26 degrees. 11 kilometers away is the A-Rosa resort with a five-star, 18-hole golf course. Watersports fans also get their money’s worth; across the lake is a watersports centre where you can go sailing and canoeing. Only an hour's drive from Berlin, you can take a day out to walk around the city, see the sights and visit one of the many museums before returning to the tranquil calm of Schlosspark Bad Saarow. 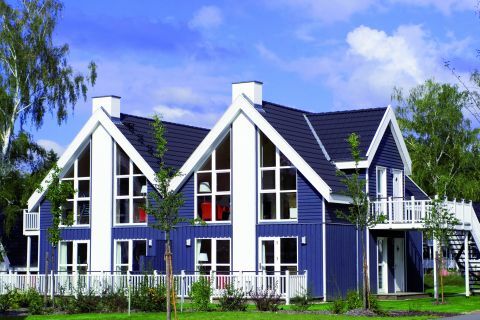 The park charges a mandatory deposit of €100 per accommodation. Energy costs are charged according to consumption, and should be paid directly to the park (costs: electricity €0,33 p/Kwh and water €7 p/m3). Tourist tax is € 2. For children between 10 and 17 years it is € 1, and for children younger than 10 it is free of charge. Payable on arrival.